Sonora waded into the water, anticipating the force of the warm waves before they hit her legs and swirled around her. She wiggled her toes as she felt the slow suction of gritty sand from beneath her feet. She startled, then smiled, as she noticed the quick flash of a sleek, grey dolphin in the ocean wave rolling in a few feet in front of her. Leisurely, she waded through the water stopping once she was thigh-deep. Dropping, she bounced with the waves and let them turn her, so she was looking back at the beach. She watched all the people with their coolers, chairs, and umbrellas as the dolphins did. The dolphins must think we&apos;re as unusual as we think they are. Rising back to her feet, Sonora brought her mask close to her lips and gathering some saliva, she spat into the goggles. She wiped it around the glass with her finger, making sure to get all the edges so her view wouldn&apos;t be obstructed. After adjusting both the mask and snorkel to her face, Sonora took a few steps and slid into the sea. As the water smoothed over her body and enfolded her, she moved from one world and into the next. She felt all the weights and cares of the topside wash away, to be forgotten during her precious hours below. She dove, investigating the small sea creatures around her, coming up only when she needed air. Listening for the hollow thunk of the water leaving her snorkel before taking a breath and again retreating into the muffled ocean below. 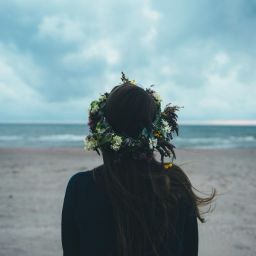 After a while, she rose to float, bouncing lightly with the movement of the sun-warmed water as tiny ripples rolled like silk over her shoulders and down her back, while others teased her feet. Adjusting her snorkel, she watched as a small group of colorful, little fish darted here and there on their endless quest for food, while other larger species slowly swam into one side of her field of vision and out the other. Drawing her attention, a little crab scurried across the ocean floor on a mission known only to him. Some people prop up their feet with their favorite book or TV show, but this has always felt like home to me. It is its own world, a whole different world. Diving to the shallow ocean floor, Sonora paused to examine some of the treasures the small reef provided. Picking up the little crab, she watched as he fearlessly tried to pinch her thumb, which was twice as big as him. Letting him think he had won, she settled him back on the sandy floor when she noticed a half-buried starfish. Waving the remaining sand off the creature, she gave it a few light strokes. After examining some colorful coral, which she knew better than to touch, she continued to kick her way across the ocean floor, stroking and gently prodding what she knew was safe and examining what was not. To her right, a school of fish startled and swam away, as she watched them her attention was drawn to the deeper parts of the ocean. It seemed darker than it should be. I must have been down here longer than I thought. Then, just out of the corner of her eye she saw it. The shadow. The same shadow she had seen yesterday, the day before, and the day before that. Sonora&apos;s brow wrinkled as she narrowed her eyes. What had been a curiosity on day one and two was worrying her on day three. The first day, Sonora had noticed the shadow only briefly, so briefly, in fact, she had later talked herself into thinking it was just a trick of the light. The second day, as she had turned toward the shadow, it had disappeared, and she was sure that it was either something floating in the water or an overly friendly but shy fish. Each time had been the same, the shadow had stayed just on the edge of her line of vision. Now, Sonora finally had to admit to herself that this was not a random incident nor was it the behavior of fish. This was the behavior of humans. Despite the warm water, a chill ran down Sonora&apos;s spine. Although there was a beach full of people above her, here alone in the ocean, she had little defense. She looked down at her empty hands and the deep water that surrounded her. For the first time in her life, she felt a threat while in her beloved sea. Wanting to know who it was, she tensed her body to move toward the shadow. But before she could turn, it was gone, like a flash of light. As if it knew her plan. The same way it had disappeared the two days before. Sonora relaxed. If it followed the same pattern, that would be the last she would see of it today. She surfaced and cleared her snorkel. Then she drew in a long breath causing a little rattle of water in the breathing tube. After a moment of indecision, Sonora decided she&apos;d had enough excitement for the day and swam for the beach. 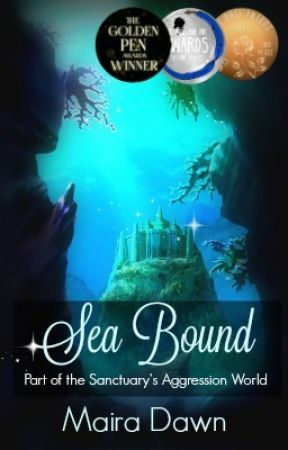 A/N: Thank you for reading part 5 of Sea Bound!